On the evening of 24 June 1859, a Swiss businessman by name Henry Dunant reached a village called Solferino, Italy. He had been travelling with the aim of meeting Napoleon the third, a powerful emperor of France by then to talk business. On his arrival in the village he found horrible war had taken place between France and Austria. It was horrible that in a single day 40,000 soldiers from both sides lay dead, dying and wounded. He was shocked by the aftermath of the battle that he abandoned his original plan of his journey and for several days devoted himself to helping with treatment and care for the wounded. He received an overwhelming relief support from the locals. After going back home he published a book titled “Memory of Solferino in 1862.” Together with four other friends in 1863 they set up International Committee for Relief to the Wounded and that ladies and gentlemen is how Red Cross came to be. 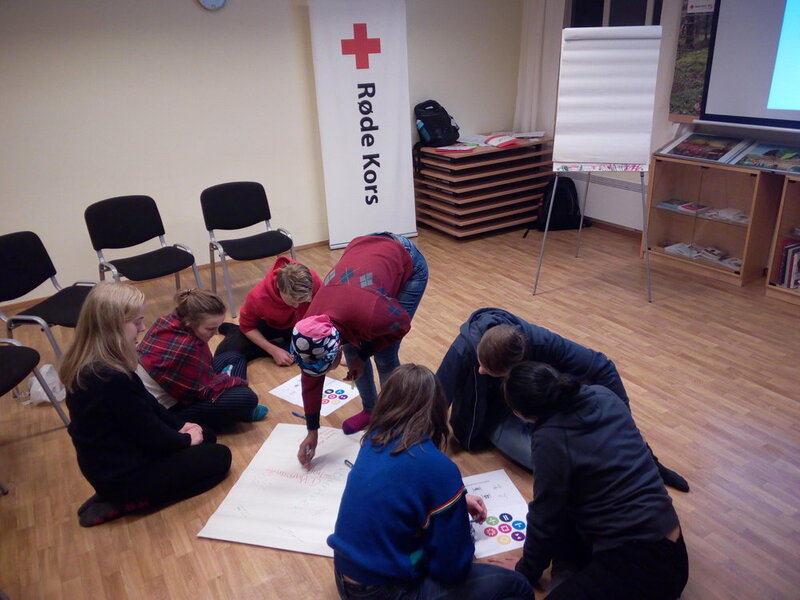 Last week we facilitated an Introduction to Red Cross course to Vestby and Ås Red Cross youth which we had been planning for a while with the group leaders. It takes a lot to have a workshop take place and therefore we would like to thank the two leaders for ensuring this was a success. As the title suggests it is a course which has been designed to help volunteers understand the role of Red Cross both in Norway and internationally, the fundamental principles that guide its work and what it means to be a volunteer (rights and responsibilities). We covered the history of Red Cross and we later discussed the structure and the democratic process in Norwegian Red Cross. The course is one of the three mandatory courses that the Norwegian Red Cross volunteers have to take. The other two are basic first aid and basic psychosocial first aid. This is almost similar to what we have in Kenya. When we first showed interest in becoming volunteers in our country, we underwent an intensive dissemination activity where we got more information on the background, the emblem and the works of Red Cross. It is where we heard HINIVUU (acronym for the seven fundamental principles: Humanity, impartiality, neutrality, independence, voluntary service, unity and universality) for the first time. It is used as a form of greeting among the volunteers. After having the mandatory courses, a volunteer interested in being part of search and rescue and disaster preparedness will have to undergo further comprehensive training. Through the course participants got to reflect on the humanitarian needs from the places they are from and how best as volunteers they could address the needs. This was an important session as it not only enabled us to share our experience but we got learn more as well. We got to see that most humanitarian needs are context based but there are some which are common. Impartiality: It makes no discrimination as to nationality, race, religious beliefs, class or political opinions. It endeavors only to relieve suffering, giving priority to the most urgent cases of distress. Voluntary Service: The Red Cross is a voluntary relief organization not prompted in any manner by desire for gain. Universality: The Red Cross is a world-wide institution in which all Societies have equal status and share equal responsibilities and duties in helping each other.